ofgpu v1.1 is the latest version of our free GPL library that provides GPU (sometimes referred to as GPGPU) linear solvers for OpenFOAM® v2.2.x. The library targets NVIDIA CUDA devices on Windows, Linux, and (untested) Mac OS X. GPU acceleration holds the promise of providing significant speed up at relatively low cost and with low power consumption compared to other alternatives. If you want to try our ofgpu library with OpenFOAM then we recommend that you use either a dedicated (i.e., not displaying graphics) high-performance NVIDIA graphics card or a Tesla card. 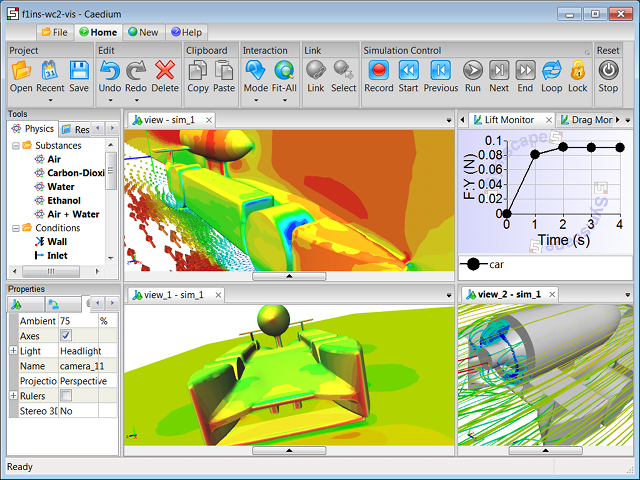 Are you looking for a GUI driven, integrated simulation environment with GPU support for Windows and Linux with NVIDIA CUDA devices incorporating a selection of the RANS OpenFOAM solvers and various import/export filters? This build procedure assumes single precision. Download our free GPL licensed ofgpu library [last update Jan. 17, 2014 to v1.1]. For Windows you will need to build ofgpu natively using Visual Studio and then transfer ofgpu.dll and ofgpu.lib to your Linux system for cross compiling. Place your natively compiled Windows files in <ofgpu-root>/install/win/lib on your Linux system. Patch your OpenFOAM source with our CUDA modifications. Note that this is the same source code patch that adds Windows support for OpenFOAM 2.2.x. Note that single precision is required. Double precision is untested. Under Windows you will need to have the $(WM_PROJECT_DIR)/platforms/<platform>/lib/cuda directory in your executable path to use the library. For an example of a GPU-enabled case try pitzDailyGpu. OpenFOAM is a registered trademark of OpenCFD and is unaffiliated with Symscape. Submitted by Anonymous (not verified) on January 24, 2014 - 15:02.
thanks for your gpu code. I tried to compiling it but I got some errors. I follow all your steps but it seems there are some error with matching function in sparsematrixargs.h. Submitted by symscape on January 24, 2014 - 15:05. Submitted by Alex (not verified) on March 8, 2014 - 12:35. Thanks for the GPU code. I followed the building instruction to step 3. The ofgpu was successfully built how ever in the /install folder, there is only one folder named lib and there is only one file inside it: libofgpu.so. In this case, does it mean there is no need to perform the step as stated in instruction: ln -s /install/release/lib /install/lib ? With the assumption that there is no need to create the soft link, I went on to step step 4. I'm not sure about the meaning of "CUDA modification". Is it simply apply the "MinGW Windows Modifications" patch at the root directory of OpenFOAM 2.2.x or I need to start from step 1 on webpage(http://www.symscape.com/openfoam-2-2-x-on-windows) to Install MinGW-w64 cross-compiler and zlib" first? Submitted by symscape on March 8, 2014 - 14:32. Sounds like you didn't set the build type (release) for cmake, that is why you are missing the release folder. You only need the MinGW-w64 compiler if you are going to cross compile for Windows. Submitted by Alex (not verified) on March 9, 2014 - 04:11. Submitted by symscape on March 14, 2014 - 09:11. Submitted by Ian (not verified) on May 20, 2014 - 03:54. Submitted by Ian (not verified) on May 20, 2014 - 04:02. I don't remember reading where $FOAM_GPU_LIBBIN had to be defined? Its used in $FOAM_SRC/gpu/cuda/Make/files and breaks my build if not set. I've set it to $FOAM_LIBBIN. Submitted by Ian (not verified) on May 20, 2014 - 04:27. I think this is because you've made the assumption everyone uses bashrc. You haven't modified cshrc in your patch. Submitted by symscape on May 20, 2014 - 08:34. There are only so many hours in a day, so I focused my efforts on bashrc. I don't see how not supporting cshrc is a show stopper. Definitely it would be better if I mentioned no cshrc support in the documentation though. Submitted by Ian (not verified) on May 20, 2014 - 08:46. I completely agree symscape. I appreciate how much time you must have put into this already, thanks. I've got it working now in Suse Linux 12.3, with tcsh (not that I like csh, its just we're stuck with it here for historic reasons). The only other headaches with the install were getting 'scotch' to build (path issues) and finally putting the compiled libraries in the right folders. It seems to be working now. If only I could get OpenFOAM to do this implicit coupled conjugate-heat-transfer problem with radiation and turbulence on a high-aspect-ratio mesh I'd finally be happy. Submitted by Charles (not verified) on September 4, 2014 - 05:17. Apologies in advance for a perhaps simplistic problem and incorrect programming references as I am not a programmer however did before attempting to build your extention built a standard openfoam distribution. Found -- enabling inotify for file monitoring. '/scratch/foam/foam-gpu/OpenFOAM-2.2.x/platforms/linux64Gcc48DPOpt/lib/libOSspecific.o' is up to date. '/scratch/foam/foam-gpu/OpenFOAM-2.2.x/platforms/linux64Gcc48DPOpt/lib/dummy/libPstream.so' is up to date. '/scratch/foam/foam-gpu/OpenFOAM-2.2.x/platforms/linux64Gcc48DPOpt/lib/openmpi-1.6.3/libPstream.so' is up to date. Thereafter all compile attempts fail with include errors as a result of missing lnInclude directives. I presume my problem is as a result of the global.C failure. Is this so or is the mpicxx.h warning appropriate and do you have any suggestions. Submitted by symscape on September 4, 2014 - 07:43. Assuming you've patched the correct version of OpenFOAM without any errors/warnings, then it appears that you are compiling for double precision (DP) whereas you should be targeting single precision (SP). Submitted by Charles (not verified) on September 4, 2014 - 09:47. Thanks for the reply, I always added the "setting" as an environment variable - export WM_PRECISION_OPTION=SP. I have now changed the etc/bashrc switch to SP and the build (running as I write) looks a lot better! Submitted by symscape on September 4, 2014 - 09:50. Submitted by Fine (not verified) on October 25, 2014 - 03:30. My OS is ubuntu 14.04. Trying to make openfoam 2.2.2 with gpu patch v3-mingw. Submitted by Fine (not verified) on October 25, 2014 - 03:50. Submitted by Long (not verified) on January 21, 2015 - 07:07. After compile the source code, Finally I successful, but when I ran the tutorial, I got the error when console print to time = 1. Submitted by Guilherme Sempionato (not verified) on April 22, 2015 - 12:49. Hi, I am facing difficulties in patching the OF source. Can I use the compiled .so library with a call in controldict using "libs"? What I really need to make the libofgpu.so works in a stand-alone mode (without patch file). Submitted by symscape on April 22, 2015 - 13:17. You have to patch the exact version in Git that matches the commit id, anything less or more will be unreliable. Submitted by Giovanni (not verified) on July 17, 2015 - 02:56. I have a problem with the solver interFoam. I tested job with solver simpleFoam, pimpleFoam and pisoFoam and I had no problem. Where is the problem with interFoam? Submitted by symscape on July 20, 2015 - 07:05. I'd guess that you are missing the 'functions' entry from your controlDict to load the GPU library. Review the 'Example Case' in the documentation above. Submitted by Giovanni (not verified) on July 21, 2015 - 03:15. Thanks for reply, but the problem is not the function cuda. has been properly inserted into the file controlDict. 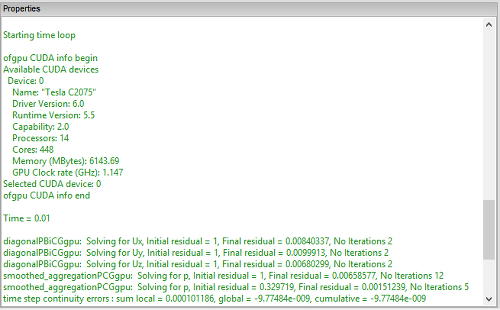 As written in the previous post, I have done various simulations with other solver. With the solver interFoam that presents the problem. What could be the problem? A bug in the library? Submitted by symscape on July 21, 2015 - 08:02. It is working fine for me with interFoam. Are you sure the gpu library loaded successfully? The error you are seeing appears to be because the library failed to load. Submitted by Manasi Tiwari (not verified) on March 8, 2019 - 11:05. Please help me fix it. Is there some other patch available?